Have you seen people sketching outdoors and wonder what they are doing? The Urban Sketchbook is the book that explains what urban sketching is all about. This book is essentially an introduction to urban sketching as a subject, one that assumes that the reader has no knowledge that such an activity actually exists. It covers the brief history of sketching from hundreds of years ago before moving on to how it has evolved and what modern artists and hobbyists are doing nowadays. There's mention of the tools used, the techniques, subject matter, style and the purpose of sketching. However, it doesn't actually going into the technicalities of techniques. This book shows you the basic information you need to know, and if you want to find out more, you can check out more dedicated books. 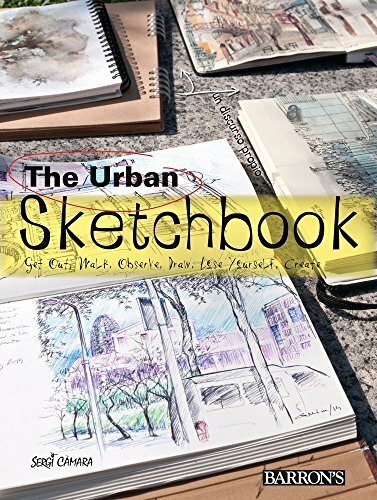 I've reviewed many books on urban sketching and this book is different because it presents an overview while most of the other books would talk about techniques or highlight the artworks of various artists. There are some nice sketches in the book but unfortunately most are not credited. So if you want to find out about what urban sketching is all about, then this book should suffice. If you realise you are interested to know more, especially about techniques, or want more in depth coverage, you can move on to discover the many other books available.